Due to a lingering back injury, world number one Simona Halep is forced to withdraw from the 2018 WTA Finals held in Singapore. 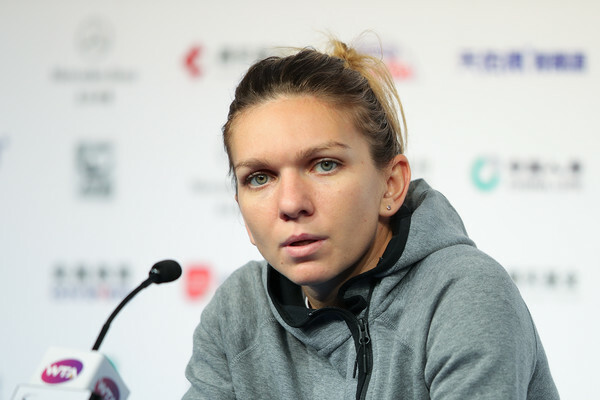 An unfortunate but expected news broke out in Singapore on Thursday afternoon when year-end world number one Simona Halep announced that she was forced to withdraw from the year-ending 2018 WTA Finals, ending her season earlier than expected due to an ongoing back injury sustained a month ago. 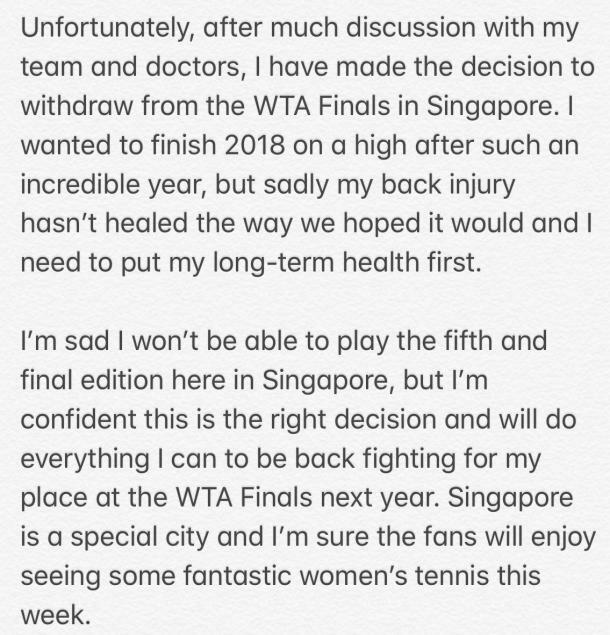 The Romanian, struggling with her back, arrived in Singapore yesterday but had decided to withdraw from the prestigious tournament having concluded that she was not fit enough to compete with the world’s best. Halep inflicted this injury during a practice session at the Wuhan Open but she has never seemed to completely recover from the herniated disk. 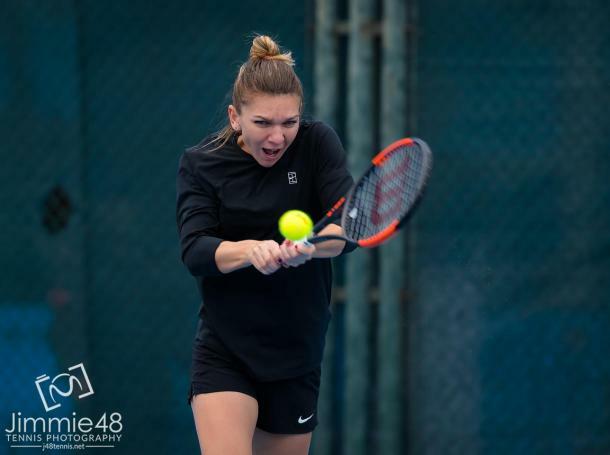 Halep fell in the opening round there, coming up short to Dominika Cibulkova and amidst her injury, she put up a tough fight before being defeated 0-6, 5-7. She competed in Beijing but retired in the first round to qualifier Ons Jabeur and her participation in Singapore was soon in doubt when the Romanian was forced to withdraw from the Kremlin Cup this week despite receiving a wildcard. 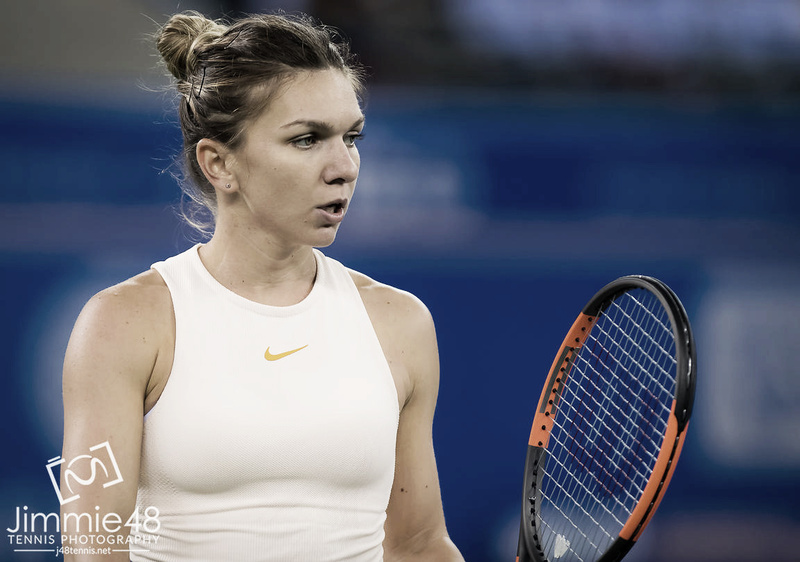 It is unfortunate that such an impressive season for Halep had to end in such unfortunate circumstances — a year which saw her grab her first maiden Major title, before consolidating her top spot in the rankings and ending the year as the world number one yet again. Furthermore, Halep was the only player who had qualified for all five editions of the WTA Finals in Singapore. With Halep’s withdrawal, Angelique Kerber is now elevated to the top spot while this also allows Kiki Bertens to qualify for her maiden singles appearance in Singapore.